Do Guidebooks Stifle Your Travel Discovery? Sitting on dinner tables, peaking from coat pockets or hiding the readers’ faces in museums, the casual observer sees the ubiquitous Rick Steves’ guidebook throughout Europe. Their wrinkled clothed owners briskly walking from one Rick experience to the next, following the guidebook as if it is the path to enlightenment. In Rothenberg, Rick’s back door travellers fill the cobbled streets each summer to experience its middle-age charm. Relaxing over dinner one night, we observed the couple at the next table thumb two Rick tomes between courses, while another woman read her order from the guidebook ensuring she received Rick’s recommendations. Furiously writing notes throughout the prescribed meal like a school assignment, she ticked off each experience before hurrying into the night to her next task. We lingered over strudel (cliché but I love it) and coffee before strolling home, unencumbered by books, cameras or the need to do anything but enjoy the night pondering how travellers use their guidebooks. We love Rick’s guidebooks, simply referred to as Rick in our family, but it informs our travel without dictating our itinerary, and adopting his guiding philosophy to find and open new back doors. Rick focuses on the culture, art and history of Europe and his guidebooks are devoted to those experiences but are they your only interests? Visiting Bologna, a town Rick does not recommend, drove our Italian itinerary because I love Ducati motorcycles and for me motorcycling nirvana is the Ducati Museum there. Without Rick to guide us, we stumbled from Bologna’s train station to our charm less, cramped hotel with erratic air-conditioning then bumbled our way through the city unable to unlock its history. Until Bologna, Rick had led the way as we lazily followed. In Bologna, we found our back door and learnt to put as much effort into our planning as Rick does into his books. The true essence of travel is to experience life from a new perspective and enrich yourself by absorbing into your everyday life the cultural elements you found attractive. 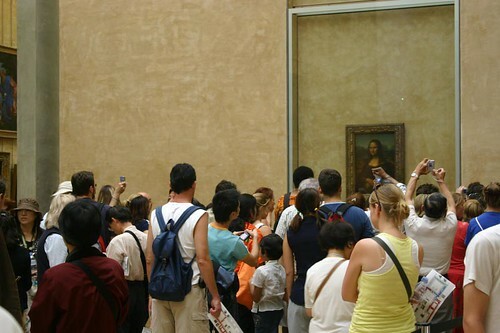 Unless participating in a high stakes treasure hunt, a photograph in front of Da Vinci’s Mona Lisa does not justify a visit to the Louvre. Search for experiences not photo opportunities and create memories rather than trophy albums containing photos of famous sights you do not understand. Follow your passion; tour the Ferrari factory, dig for antique dolls in Thüringen or attend a rock concert in Paris to find your back door. Europe Through the Back Door opened the way for travellers looking for more than a package tour racing them from curio shop to curio shop. As Rick Steves graduated from independent tour guide to travel guru, some readers lost part of his message: to experience other cultures not just view them through the tinted window of a tour bus. Leave the guidebook in the hotel room and blaze your own trail through an unfamiliar city. Rick is a guide not a messiah; use his guidebook as a tool not a bible, and a revelation in travel awaits you. See you at the Travel Festival I’m hooked. Related blog entry posted at the Sydney Morning Herald Travel Blog.